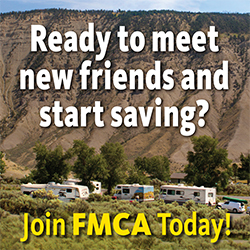 CLICK HERE to create your free FMCA Forums Account or JOIN FMCA to become a member and gain full access to all our fantastic benefits, including the FMCA Forums. Updates on policies or general info for all Community members. Helpful hints and tips for making your visit here more enjoyable. Post forum-related questions and comments here. 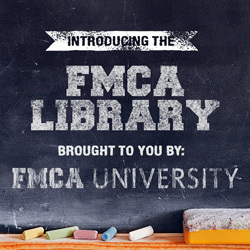 News and updates from FMCA [read only]. Not a RV owner yet? We can fix that. Ask questions and get advice here. For owners of Type A motorhomes, which are built on a bare, specially made chassis. Also: bus conversions. The Type B is the smallest self-contained motorhome and includes van campers and van conversions. Built on a van chassis produced by auto manufacturers. Discuss all topics specifically r/t Fifth Wheels. Discussions specific to Travel-Trailers go here. Discuss RV insurance coverage, carriers, rates and more. Do you use an emergency road service program? Who is the best provider? What features do you look for? 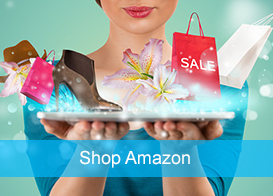 Share and get info here. Discuss providers, coverages, costs, considerations and your experiences related to RV extended service plans. Show us what you drive and travel in. Include a description -- motorhome type/class (A, B, C), make, model, year, length -- and any other details you care to share. The motorhome's 12-volt DC, 120-volt AC systems. Batteries: size, recharging, maintenance. Plus: generators, alternators, inverters, converter/chargers, solar power. All things related to the motorhome's foundation and its components, including steering and suspension systems. Discuss any alterations or additions to your RV. Proud of a do-it-yourself project? Talk about it here. Focuses on motorhome power plants, gas and diesel, and fuels. Tips, equipment and systems used for leveling the motorhome while parked. Discuss everything related to towing a vehicle behind a motorhome. Equipment, braking, laws, vehicles approved for towing four wheels down. Towing issues with 5th wheels and Trailers. Maintenance, sanitizing, emptying of the gray water and black water tanks. Toilet maintenance. Discuss anything about tires: size, brand, tire pressure, tire load/inflation, tire pressure monitoring systems, FMCA Michelin Advantage Program. Discuss types of Internet connections, including wireless, satellite and cellular. Tips and equipment for using high-speed Internet while traveling. Plus: E-mail, blogging, and other ways to keep in touch while RVing. Audio/visual systems, GPS mapping, satellite TV, tech gadgets. Discuss equipment, connectivity issues and more. Recommend and talk about your favorite RV parks and resorts. Talk about where you've been or where you want to go. Ask questions about trip routes. Discuss RV resort living. Snowbirds also fly here. Would you like to meet up with other RVers at a campground, a sporting event, a concert or a special happening somewhere? Enhance the fun by organizing casual get-togethers. Discuss motorhoming to Canada, Mexico or overseas. Taxes, parking rights, voting rights, vehicle size limits, driver license requirements, firearms, public land issues and other regulations that affect RV owners. Introduce yourself. What type of motorhome/RV do you own? How long have you been motorhoming/RVing? How long and how often do you travel? What do you like best about motorhoming/RVing? What are your favorite destinations? Camping without using modern conveniences of electric, water and sewer hookups. Relying instead on batteries, generator, solar power, stored water. Also known as dry camping. Topics pertaining to those who live and travel full-time in their motorhome, or who plan to someday. Forum for outdoor pursuits enjoyed in conjunction with motorhoming and RVing: hiking, fishing, geocaching, rockhounding, snowshoeing, snowmobiling, all-terrain vehicles. For motorhome owners who travel with pets, or want to. 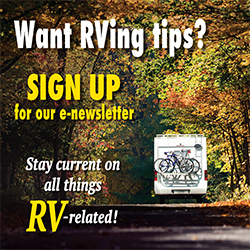 If you can't find a place for your RV-related comment elsewhere on the forums, then this is the place to post it. A place for discussing service to your country. Open to everyone. Not a political forum. Post your pictures and win prizes. There are no ongoing contests, currently. Please keep all test posts in this forum. This forum is periodically emptied and posts made here will not count toward your post count.